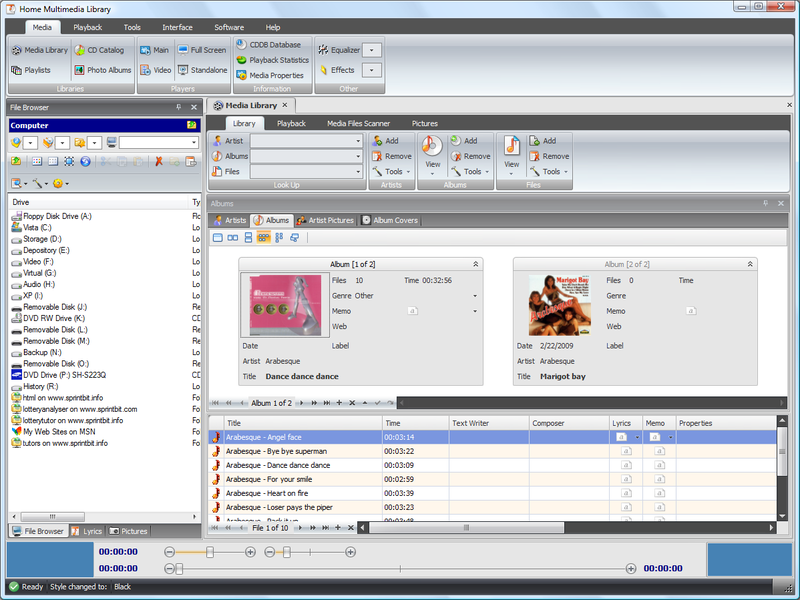 You can create catalogs and libraries of your CDs, photos, playlist and audio and video files. 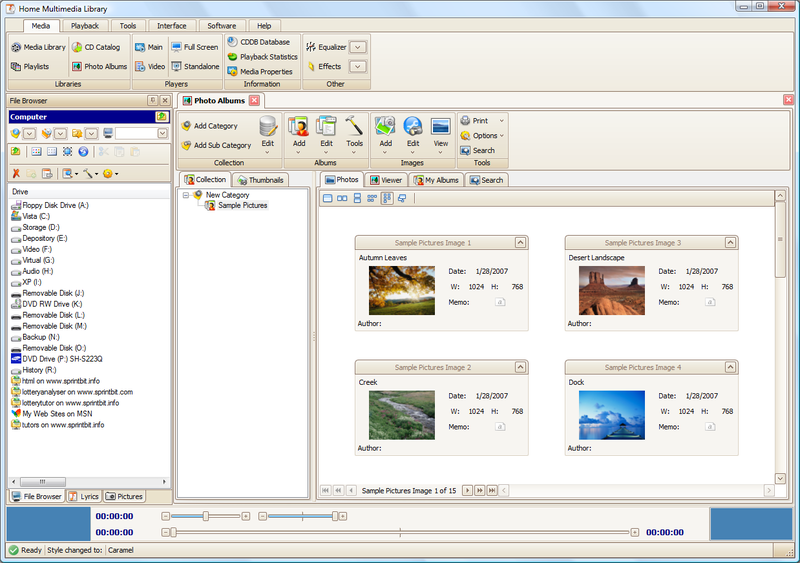 The software has built-in four multimedia players and includes Playback Statistic, Internet Radio, CDDB Database, File Searcher and some other useful features like built-in File Browser that lets you easily manage files on your computer and add files to your libraries. 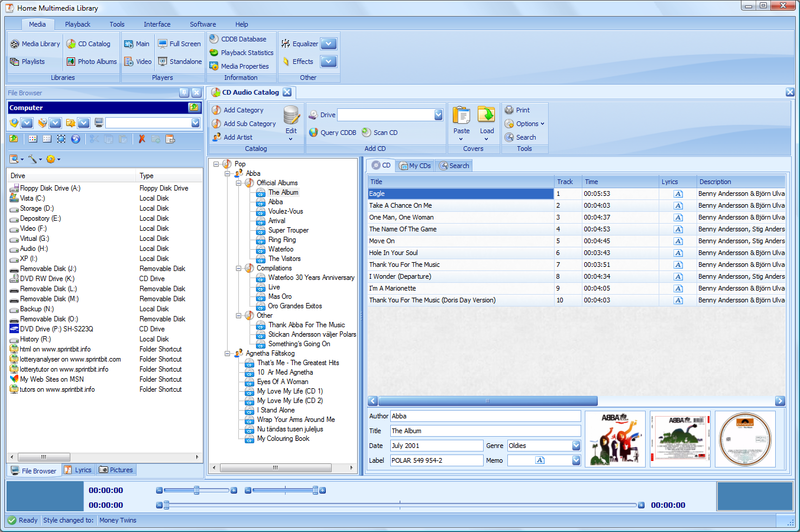 All major audio, video and playlist files are supported. Please see below what you can do with its capabilities and features. Media Library lets you can organize your entire collection of audio and video files into a library of Artists and Albums. Media Library can store all kinds of information about created artists, albums and files entries. You can keep artist pictures, biography, discography, lyrics and much other information. In addition to organizing your files you can also store them in the database file as well. Photo Albums lets you create albums of your digital pictures. You can organize pictures into albums with categories, view and edit pictures. In addition to organizing pictures you can store them in the database. Files stored in the database can be additionally encrypted. CD Catalog library lets you create a database of all your CD audio discs. You can scan your discs and store all tracks information, lyrics, CD properties, front cover, back cover and CD picture. To scan your CDs’, you can also query the CDDB Internet database for track names and album information. In addition, album's front cover image can be downloaded from Internet as well. Subtitles Editor is a database of lyrics and subtitles you can collect. It has also an editor that lets you edit synchronized timelines with the playback. You can view subtitles or lyrics text while listening to the audio, video files or watch movie. Playlists Database is a library where you can store your playlists files.